Another one in our list of the Top 5 Minox Binoculars is the Minox BV 10×42. This is a full-size waterproof binocular with high-quality and state-of-the-art optics. We shall talk about the features and specifications of this binocular and try to dissect each one of them for your reference. So just sit tight there as we take you for a ride with the BV 10×42. CLICK HERE to BUY the Minox BV 10×42 @ a GREAT PRICE and any available DISCOUNT! 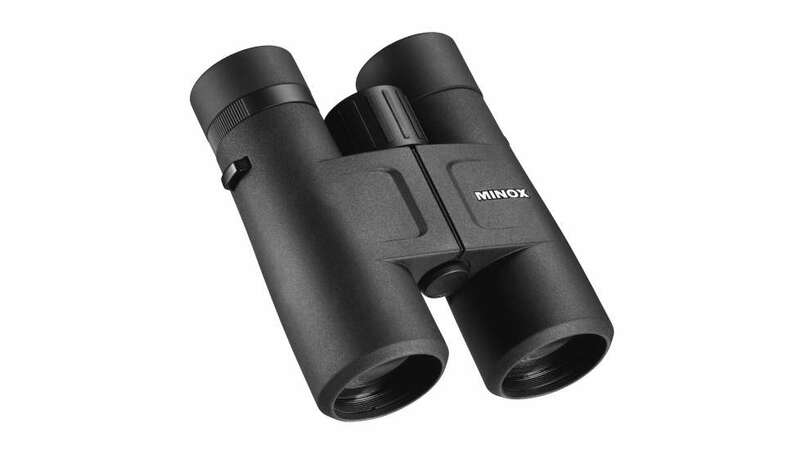 The Minox BV 10x42mm is designed as an outdoor binocular. It is an ideal all-purpose companion for nature observers and hunters who would want the smallest detail possible of images in the field. In the subsequent sections, we will discuss in more details each of the features of the BV 10×42. Pretty similar to the other Minox binocular models, the BV 10×42 is applicable to operate on a temperature range of 14 °F to 122 °F (or -10 °C up to 50 °C). This is very important to take note of so you won’t end up compromising your binoculars. Remember not to use your binoculars outside these boundaries! The BV 10×42 also features Minox proprietary “M* Multi-Layer Lens Coating” with Phase-Corrected Prisms. The combination of the multi-coated elements and phase correction coatings result in minimum light reflections and high light transmission which gives your views neutral color rendition, excellent detail and high image contrast even in such low light conditions. The BV 10×42 has such a very decent Field of View (FOV) of 342 feet at 1,000 yards (or 6.5°, or 114 meters at 1,000 meters). This wide FOV will definitely make you enjoy looking at those birds and wildlife. The front lens diameter of this binocular is 1.65 inches (42 mm) and with a magnification power of 10x, this makes an Exit Pupil Diameter of 0.17 inch (4.2 mm). The Close Distance Focus capability of this binocular is 3.94 feet (or 1.2) which makes it ideal for those close-up views you might like. The BV 10×42 comes with a fix power (magnification) of 10x, no more, no less – which means that you can’t vary the magnification. The body of the BV 10×42 has an extremely slim figure. This is because of the modern roof prisms and the elegant rubber armoring which gives you an ergonomic feel of the binocular resulting to less fatigue when you hold it. The aluminum body, which is very sturdy, protects the optical systems and precision mechanics inside against dust and water. Corrosion and fogging protection of the internal is done through Nitrogen purging. Innovative sealing technology makes this binocular waterproof as well, down to 9.84 feet (or 3 meters). The actual size of the BV 10×42 is 5.5 x 5.0 x 2.0 inches (140 x 127 x 51 mm) – that is, Height x Width x Depth – and weighs about 27.5 ounces (or 780 grams) which makes this binocular really compact and lightweight – very easy to handle! The BV 10×42 comes with twisting eyecups providing eyeglass wearers their needed eye relief. The twisting of the eyecups provide for a relatively good eye relief of 0.60 inch (15.0 mm). The package also includes a nice-looking case and a strap. This binocular comes with a fix magnification power of 10x, no adjustment available. The rubber lens cover supplied with this binocular is somehow susceptible to falling off, not really a big issue but good to know. Based on user experience, as you can see above, the BV 10×42 is a high-quality piece of equipment that is impressive in its performance in the field. If you’re looking for a binocular to use on your various outdoor activities that has high quality optics but not so pricey, the Minox BV 10×42 is indeed a great option. With its German-designed, state-of-the-art optical systems and ergonomically compact, lightweight body, you’ll totally enjoy those views and images. With its highly optimized optical performance that comes at a relatively cheap price and great reviews from verified users, we highly recommend you check out the BV 10×42. It is one of the best outdoor binoculars out there at this price point. CLICK HERE TO SEE THE BV 10×42 PRODUCT PAGE. If, for any reason, you do not like the BV 10×42, you can go back to our listing of the Top 5 Minox binoculars and have a look at the other popular binoculars in our list.